A child in the war-torn African nation of Mali just wrote a letter to the UN World Food Programme (WFP). Emergency school meals are being provided by the WFP in Northern Mali. This food is nutrition for their mind and body. But also for their spirit and soul. Food is hope. WFP’s plan is to feed children but at the same time get them back in school and learning. It’s a strategy that is proven to work. They are going full steam ahead at providing these meals through the rest of this year. Right now 120,771 students in Northern Mali get two meals a day: an enriched breakfast and a lunch. Volunteer cooks also receive take home rations. It’s common sense that school meals are important, especially for a nation trying to find that road to peace after a war. Tragically, that does not always translate into funding for school meals. When international relations is discussed it seldom revolves around humanitarianism, the very thing people around the world need most. For Syrian refugee children school feeding is one of the few things they can count on during this time of upheaval in the Middle East. The WFP is providing 2,000 children right now with school feeding at refugee camps in Jordan. They hope to expand to 30,000 by the end of the year. In Iraq over 4500 refugee children have received high-energy biscuits at school and summer camps. WFP needs funding to make sure school meals continue the rest of this year and into next year. The UN food agency relies entirely on voluntary donations. That means budget decisions by the U.S. Congress have a dramatic effect. If funding disappears so too will the school meals. That is a silent tragedy that goes unseen. In Mali, WFP has a homegrown school feeding project in the Southern part of the country. By helping small farmers become the providers of the meals, it helps build the future of the country, one where they can sustain themselves. 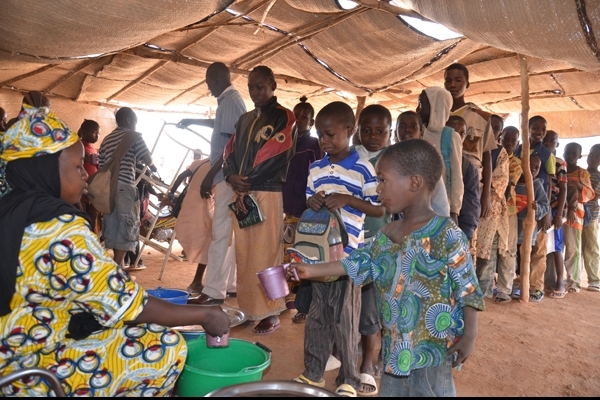 Catholic Relief Services (CRS) also has a school feeding program in Mali which is set to resume in October. Kristina Brayman of CRS reports the program will operate in 310 schools with an end goal of feeding 80,000 children. The U.S. McGovern-Dole school lunch program supports this CRS initiative in Mali. The Congress will be deciding in the coming weeks how much funding to give McGovern-Dole. This will have a big impact on the future of school meals in U.S. foreign policy. Some members of Congress want these budgets made responsibly and are desperately trying to get the fight against hunger at the top of the foreign policy agenda. Representative Betty McCollum (MN) recently introduced the Global Food Security Act. This would create a White House level coordinator to improve the U.S. response to world hunger.